This is a very capable mobile hotspot that is compatible for use around the globe. It provides the opportunity for those that need to take the Internet with them to have an excellent mobile solution. It is, after all, risky to rely on providers that are unknown. If you rely on 3G connections at home then this device makes a lot of sense when paired with one of the great Giffgaff or T Mobile sim only deals that can be found online. 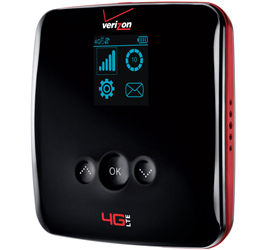 This solution is flexible and powerful and has 4G LTE working at lightning speeds. It also powers the Internet for up to 10 devices at the same time and is really focused more on the US market than elsewhere. This device is probably best for those that are looking to roam around the US and enjoy Internet wherever they are. The connection speed is based upon the mobile connection obtainable where you are. Download speeds peak at around 5MBPS and upload speeds are somewhere around 3MBPS. When you get into more remote locations, of course, the Internet connectivity speed will drop and could well disappear entirely. The mobile hotspot itself is fairly clunky and large at 3.5 x 3.5 inches and over 0.5 inches thick. Of course, it’s not a phone; it is a mobile hotspot so it’s probably going to end up being in a bag anyway so this shouldn’t be a major issue. The battery is 1700mAh and is going to lead to very disappointing battery life performance. You will end up having to find somewhere to charge it. While charging it can still work though, so long as you aren’t in a remote place, this shouldn’t be too much of an issue. The company claims that the mobile hotspot can work for up to a 100 feet circumference, however, performance drops significantly at around 80 feet normally. The hotspot works with most devices – you are able to connect devices like laptops, mobiles, iPads, Galaxy Tabs, etc. The network settings are easily customisable and the display is simple. Overall, the performance of the hotspot is pretty good. Connections are reliable, and the speeds, sufficient. The fact that Verizon has enabled the device for up to 10 pairing devices is a real bonus, in my opinion. On the negative side, the battery life could certainly be better and the user interface could also have been made nicer. The hotspot works in more than 200 countries, but lack of unlimited data connectivity packages will mean that if you are looking for a media experience this hotspot is probably not for you. Certainly a good option if you are looking to travel to America though and roam around or go for road trips. It is also a decent business solution for the regular traveller who prefers the security of a 3G or 4G connection to an open wi-fi one. All the traveler needs is to buy a local sim card to fit inside the device. Phil Turner has found some amazing T Mobile sim only deals that really make sense for anyone who has a phone already.